Any neuron that participates in sending impulses from receptors to CNS are referred as sensory neurons. But I often see bipolar neurons of eye(which according to the above definition should be sensory neurons) being called interneurons. Same is the case with the amacrine cells and the horizontal cells. So what are sensory neurons? Are all the following retinal neurons sensory? And, as soon as the neurons of optic nerve terminate in optic lobe, then are all the neurons in the optic lobe connected to the neurons of optic nerve called interneurons? Are all the neurons of brain interneurons? Obviously, there are neurosecretory cells in the hypothalamus that I wouldn't consider interneurons. Still, wikipedia tells us that only 20% of neurons in the cortex are interneurons. Unlike the peripheral nervous system (PNS), the central nervous system, including the brain, contains many interneurons. In the neocortex (making up about 80% of the human brain), approximately 20-30% of neurons are interneurons. Shouldn't that be about 80%? In short, yes. Any neuron that is involved in conveying sensory information from the periphery to the CNS is a sensory neuron. So I would consider all of those neurons in the retina sensory. Arguably amacrine and horizontal neurons do not convey information "towards" the CNS, but they are involved in the processing of sensory information, therefore I would call them sensory. However I wouldn't split hairs about it if the consensus on amacrines/horizontals was interneurons, not sensory. I guess the confusion is that many categories of neurons are not mutually exclusive, so neurons can be both sensory and interneuron. Once reaching the optic lobe (I assume you mean areas in the thalamus, midbrain etc. ), then the CNS neurons can loosely be classed as projecting/interneurons. Interneurons will remain within a region of the brain, often inhibiting activity in other cells within the region (or exciting). Projecting neurons will carry information to a different brain region, or back out to the periphery. These are very loose, in a nutshell classifications though. Once you start looking at a specific region, e.g. the Lateral Geniculate Nucleus, then the neurons will be further classified, either by shape, function, neurotransmitters, inputs or outputs, or a combination of the above depending on the requirements of the system. Edit: To elaborate, the types of neurons in the brain will usually be described in an area specific fashion, e.g. the lateral Lateral Geniculate Nucleus has 3 major classes of neurons, magnocellular, parvocellular and koniocellular, as well as some interneurons and supporting cells. Whereas about a dozen types of neurons have been described in the cochlear nuclei, including pyramidal, stellate, giant, golgi etc. But at this level, you would be looking at very specific differences that are not necessarily relevant to the pathways involved. I would argue that interneurons are small and restricted to individual brain regions, e.g. the visual/auditory cortex, many of the neurons, e.g. pyramidal neurons in layers IV and V are generally projecting neurons that carry information around the brain. I don't have specific numbers for percentages, but about 20% interneurons sounds reasonable to me. According to definitions, I can say 'yes' to all your statements. So what are sensory neurons? Are  retinal neurons sensory? neurons [that] run from the various types of stimulus receptors, e.g., touch [receptors and the rods and cones in the retina]  to the central nervous system (CNS), [i.e. ], the brain and spinal cord. Fig. 1 explains what a sensory neuron is. 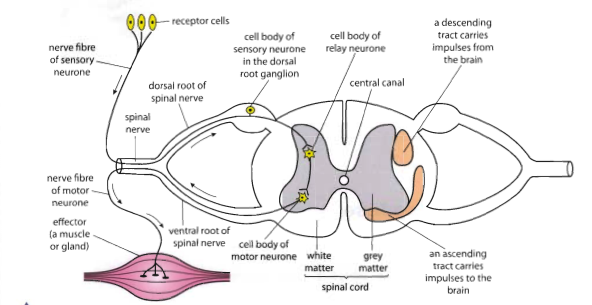 Note that the cell body of the sensory neuron is located in the dorsal root ganglion, just at the boundary of the peripheral nervous system. The relay neuron is located within the spinal cord, and is hence classified as an interneuron. Thus, sensory neurons are located in the peripheral nervous system. Are all the neurons of brain interneurons? All of the brain's neurons are interneurons, per the classification of neurons in sensory, motor and interneurons. As BrianKrause pointed out, often the term interneuron is reserved for inhibitory GABAergic cells, especially in the scientific literature (e.g., Markam et al., 2004). The classification in motor-, sensory and interneurons is rather a schoolbook way of explaining the types of neurons. It increases the understanding of the classification of the different neurons, but you will inevitably encounter shady areas where things fall apart; consider the fact that the retina is often regarded to be a part of the CNS, because of its embryonic development (Purves, 2002). So while I support the above answer, it's important to note that it comes down to a gross over-simplification of the nervous system. Such blunt definitions tend to fall apart when looked at more closely. Not the answer you're looking for? Browse other questions tagged neuroscience neurophysiology eyes central-nervous-system peripheral-nervous-system or ask your own question. Where are interneurons in Autonomic Nervous System? What neurons make up the CNS? Why are primary sensory cells considered neurons but muscle cells are not? If motor neurons are part of the CNS, what is the PNS made of?